In May, Amazon announced one of its most significant changes to ever impact Amazon customer service – a steep 20% increase to the annual fee for Amazon Prime members. Amazon began rolling out the increase to renewing Prime members on June 16th. 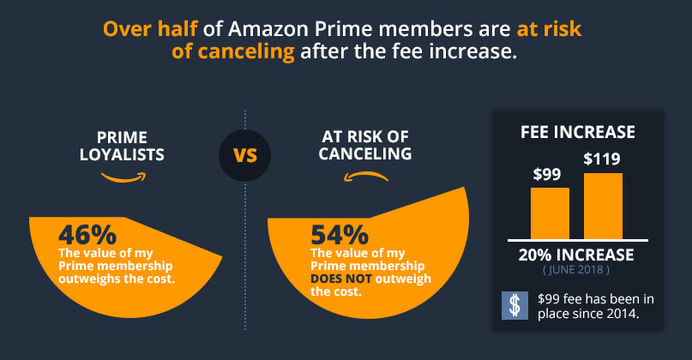 According to a recent survey by Effective Spend, 54% of Prime members are at risk of canceling their membership due to the fee increase. This potential exodus of Prime members presents an excellent opportunity for other online retailers. The survey looks at what these “At-Risk” Prime members care most about when shopping on Amazon, which suggests some key optimizations retailers can make to their own sites to convert Prime dropouts into their own loyal customers. You guessed it. Customer reviews are still KING! 60% of the At-Risk Members surveyed said that they “always” read customer reviews before purchasing a product on Amazon. Another 30% said that they “often” read reviews before purchasing. At-Risk Members also responded that the content they read in the reviews is more influential than the total number of reviews for a product. While gathering reviews can be a difficult and time consuming task, retailers can identify their top selling and most profitable products and focus on getting a couple of high-quality written reviews for those products. Even a single 5-star review with good written content can go a long way in converting a visitor. Retailers aren’t bound by Amazon’s customer review rules when gathering reviews for their own websites. Unlike on Amazon, you can provide incentives to customers who leave a review on your own site, such as offering a discount on their next purchase. And, outside of Amazon, you can use any means of communication to reach out to your own customers to request reviews – emails, phone calls, box inserts, etc. The active wear company Outdoor Voices has built up something of a cult following in a very short time without relying on Amazon. They’ve invested a ton of effort in collecting customer reviews on their site. Furthermore, they do a great job of highlighting some of the best and most insightful reviews for their products right within each product page. When comparing different types of product page information, At-Risk Prime Members ranked product descriptions as most influential in their purchasing decision. Product descriptions outranked other product page elements, including videos, measurements and instructions. Read customer reviews – both positive and negative – to understand what information reviewers are trying to share with their fellow consumers. Likewise, if you have a Q&A section, don’t just answer customer questions – determine which questions you can proactively answer within your product page content. Check in with your customer service department to understand what questions they are getting most often from shoppers. Furniture is a tricky and often stressful product to purchase online, and Wayfair provides a very informative shopping experience, striving to understand what questions customers have had or will have about their products. Many of the product features and details are written as if they are directly answering question that the shopper has. In this example of a sofa with a fold out bed, they ensure that the shopper knows what size the fold out bed is (Queen) and that (Yes!) the mattress is included – two critical details the shopper will need to know before making a final purchase. The survey found that at-risk Amazon Prime members ranked images as the second most influential form of product information behind the product description. Images tell customers a lot about your product and very efficiently at that! Show the product in context of how it’s going to be used. For example, a cutting knife can be shown cutting food in a kitchen. Provide an image that gives a size perspective relative to a familiar object, for example, your product pictured next to a house or being held by a person. Show different angles of the product in case certain features are hidden from one angle that can be seen in another. Include an image of the packaging along with any accessories included with the item. Think of the product images as a means of proactively answering customer questions in a visual rather than written format. 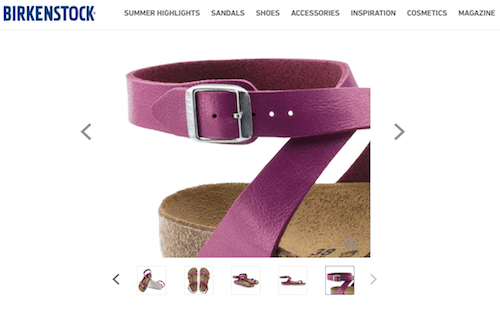 Several years ago, Birkenstock famously broke up with Amazon. While they’ve mended ties and are selling on Amazon once again, they’ve enhanced their own site to drive more direct sales. For each shoe product, a shopper can view 5-10 different high-quality images of the shoe, including images of the shoes “in action” on someone’s feet and close-ups of the shoe so that you can see the detail of the material and style. They’ve implemented a responsive color selector, as well, so that each image of the product can be viewed in each color available. The survey revealed that 80% of At-Risk Members are purchasing products from Amazon that are typically under $50. Furthermore, 94% responded that they’ve purchased a product that was less than $10. Amazon Prime members are comfortable purchasing low cost items when shipping fees are a non-issue. One of the things that Amazon does best is to provide product recommendations and suggestions to help guide customers toward adding more items to their cart. Retailers can employ similar product suggestion strategies, recommending add-on and accessory items that can expand the revenue on each order and push customers toward the free shipping threshold. Show “purchased together” recommendations to encourage the purchase of complementary products. Recommend bundle deals that include the primary product along with necessary or popular accessory items. Proactively suggest re-orders of products that need to be re-purchased frequently while customers are shopping for other items on your site. UrbanStems is a great example of a site that has the “candy isle” concept down. First, you choose your flowers, then, they suggest multiple add ons (including actual candy!) for around $10 which will all complement your order. An honorable mention also goes to H&M. On any given product page, you’ll see a scrolling list of recommended product pairings, including basic items like undergarments to add to your order. Without the safety net of their Prime benefits, shoppers are less likely to take risks with their purchasing decisions. The Effective Spend survey found that Prime Loyalists (those unlikely to cancel their membership) are 9% more likely than Non-Members to buy unfamiliar brands. Additionally, Prime Loyalists are 10% more likely to purchase products with less than a 3 star rating compared to Non-Members. This is understandable given that Prime benefits provide a sort of safety net and reduce the risk of things like paying for expensive return shipping fees. Retailers should consider ways to reduce risk for their customers and make them feel more confident in their purchasing decisions. Work with customers to get more 5-star customer reviews – as discussed earlier, this is one of the most important ways of building confidence in your product. Offer free shipping on a customer’s first purchase. Highlight your “easy returns” process. Implement a live chat and prominently display it to encourage customers to ask questions that they need answered before they can complete their purchase. Prominently display your customer service phone number so customers with questions can quickly reach someone. Competitive Cyclist makes customers feel at ease right from the start, offering a discount off of your first order, a low free shipping threshold, and easy to find help chat and phone support. Natalia Wulfe, Media Director, Effective Spend Natalia and her husband, Brian Wulfe, own and run Effective Spend, a digital marketing agency specializing in PPC advertising, Amazon marketing, SEO and Digital PR. Natalia brings more than 15 years of professional marketing expertise to the company. Through both her agency and in-house experience, she has led initiatives in eCommerce advertising, lead generation, CRO and online merchandising. A proud native of Austin, Texas, Natalia enjoys sharing the wonders of her weird city with her two young daughters. Informative post, Natalia. With everything moving towards voice search, where people are asking more specific questions when searching, I think the reviews are going to be even more important. People always want to know what the reviews are of what they are considering buying. A lot of these things seem common sense, but they are really important to check off the list. Thanks for a great post. 46 Conversion Rate Optimization Hacks Can AI Marketing Tools Increase Your Website’s Conversion Rates?